I’ll go right ahead and say it: I hope this woman makes full recovery and the entire family can get past this tragic incident. Having said that, other things need to be said as well. Liking guns and being a strong gun advocate is not enough. An adult need to be a responsible gun owner in every sense of the world. I’m not talking about giving gun haters “ammo”. It’s not about that. It’s about being a responsible adult plain and simple and we must admit that most adults simply do not fit that category. I don’t know exactly what happened with this woman and her son inside that car. What is clear though is that a 4 year old got hold of a loaded gun and that is simply not acceptable. Some have suggested that she kept her gun in her purse. If that’s the case then the negligence involved is considerable. She was shot through the seat while driving, meaning she was shot through the back and therefore that’s where the child was. A child that age always travels in a child seat of some kind, meaning he can’t move around freely or pick something that was dropped in the car’s floor. The gun was either left in the backseat by accident or kept in her purse in the back seat next to her child, both of which are unacceptable. Had the gun been with her or in the front seat next to her this wouldn’t have happened. Ladies, purses are for wallets, phones and maybe makeup but not guns. Guns go in waist holsters. 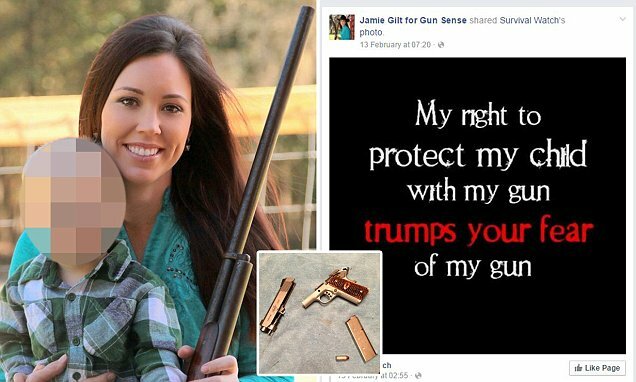 In 2014 another mother was shot by her 2 year old in a Walmart when he got her gun out of her purse. It’s not the first time that seemingly proficient and trained gun owners fail terribly at applying basic common sense. Not long ago a 9 year old child killed a firearms instructor when he switched the child’s Uzi to full auto. It’s hard enough for trained operators to keep all rounds on target in full auto in an SMG, you can imagine how hard that can be for a 9 year old child. Again, unimaginable negligence that ends up costing someone’s life. The problem with gun ownership isn’t guns but the people owning them. You need a car license to drive a car. You don’t need one to buy a gun in America but as I’ve said many times, owning a gun without professional instruction is as irresponsible as getting behind the wheel of a car without having a clue as of how to drive it. Shooting some beer bottles with uncle Bob does not constitute professional firearms training. With so many people owning guns without having the slightest idea of how to safely handle one it’s amazing that there’s not even MORE accidental gun related deaths. A gun is not a TOY. It’s a tool intended for killing people. Yes, that’s exactly what it is and it’s literally dead serious. You may use it for sports, for hunting, target practice, or for self-defense, doesn’t matter, but 99.9% of the firearms out there have a martial origin one way or another. People that fail to admit this or understand this are dangerous to themselves and others. In countries where laws force people to have a safe and take adequate firearms training accidents involving firearms are a fraction of what they are in America. Guns kept in their safe and away from a mentally unstable young man would have stopped Adam Lanza from murdering 28 people including 20 children. Those people are dead because of Nancy Lanza’s negligent gun ownership. You want to do something for the right to keep and bear arms? Have a gun safe and get professional training (and apply the gun safety rules learned!) even if you are not forced to do so by law, but still do so because it’s the safe, responsible thing to do. The two or three incidents you cite simply do not support "most adults" not being responsible. If it truly was most adults, we'd be having two or three of these cases every day. There are around 300 million guns in this country, and while no one knows the true number of owners, it has to be around 10 million; probably more. When 3 cases happen in a couple of years, that's a tiny, tiny fraction of 1%. You say that you don't need a license to buy a gun in the U.S. This is simply not true. I can't speak for every other state but here in Massachusetts I had to take an educational course including simulated shooting practice and wait a month to get my concealed carry license card. And I can't buy a gun without it. (there's also another, lesser category of license holder in Massachusetts, for which license you also have to take an educational course). They run a background check on gun buyers every single time a purchase is going to be made. It's tragic that the woman in question made such a mistake but even knowledgeable, well meaning people make mistakes. Despite what empty suit fascist Obama would say, there's no shortage of requirements and scrutiny for gun ownership in the U.S., certainly not in Massachusetts. Ferfal, check the CDC's numbers for accidental gun deaths per year in the US. The years I've looked it's been between 500 and 600 per year, about a fifth of the number of deaths from ingestion of household poisons, and far, far fewer that in automobiles. Given there are an estimated 300,000,000 guns in private ownership in the US, this is not indicative of any trend or problem.